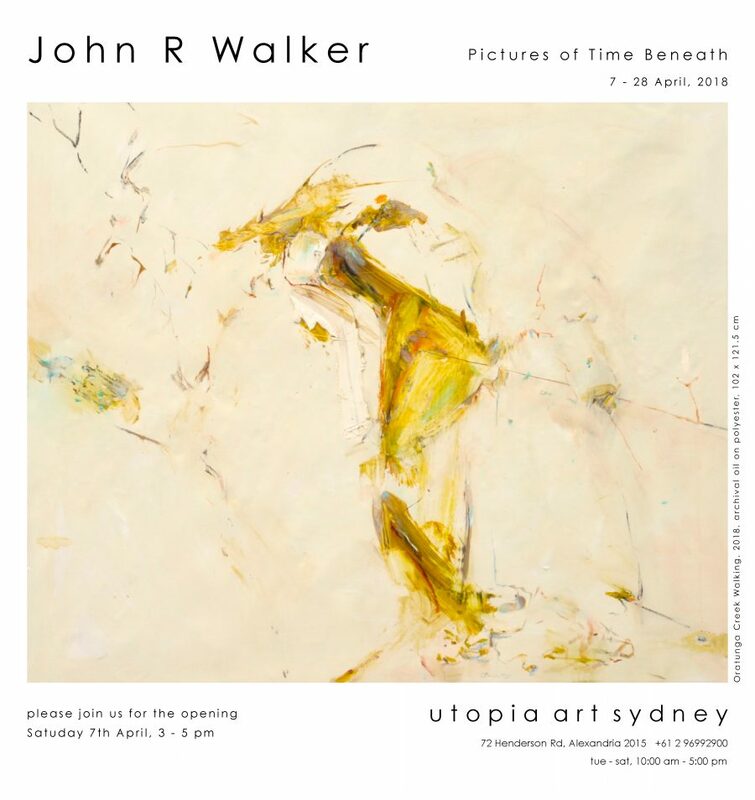 Utopia Art Sydney has represented John R Walker for 30 years and is always happy to handle any enquiry about the artist and his work. The gallery is located at 72 Henderson Rd Alexandria Sydney NSW Australia. Utopia Art Sydney stages regular exhibitions of John R Walker’s paintings and works on paper and maintains a stockroom of his work. 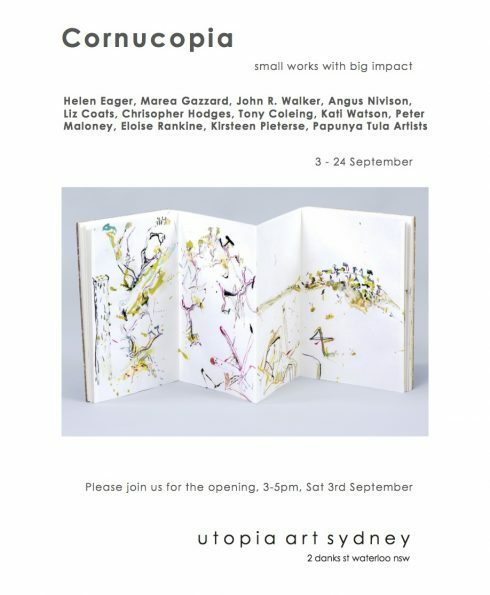 For more information, please contact Utopia Art Sydney email here or phone +61 2 9699 2900. October-November 2018: There’s something endlessly fresh about a sheet of paper, a brush and some black ink…. 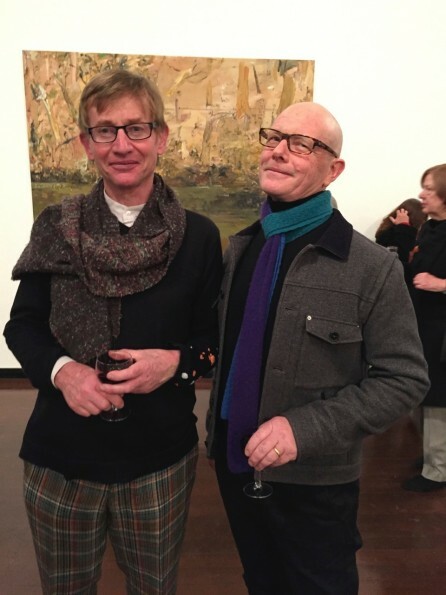 ADELAIDE BIENNIAL 2018 website goes LIVE! 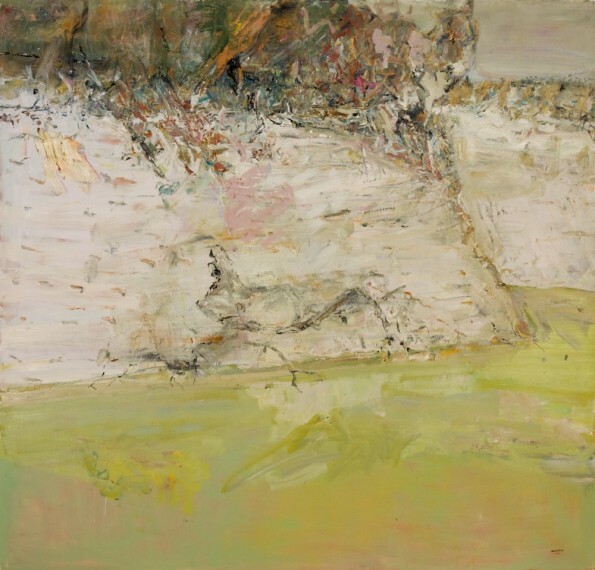 plus read Varia Karipoff’s interview for Art Guide with John R Walker – HERE! 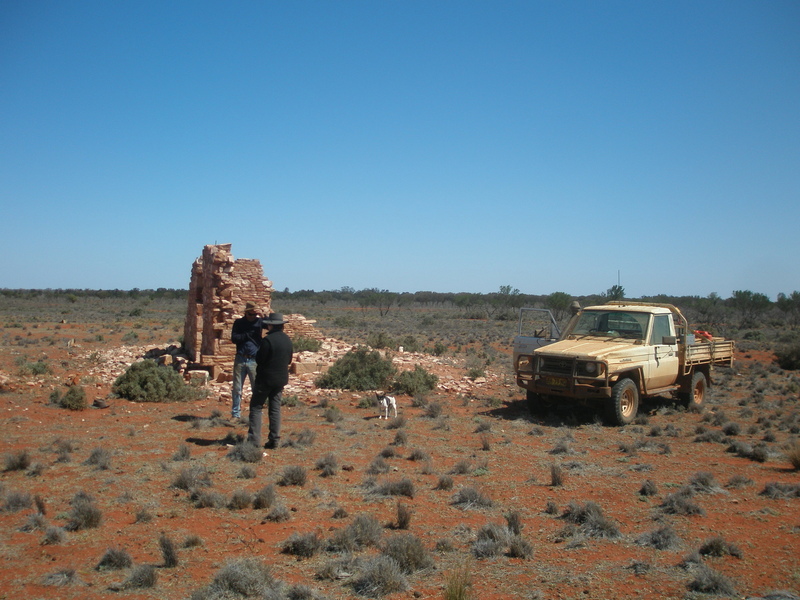 John R Walker’s magnum opus, Burra Oratunga Suite, Adelaide Biennial ‘Divided Worlds’ @ Art Gallery of South Australia 3 March – 3 June, 2018. 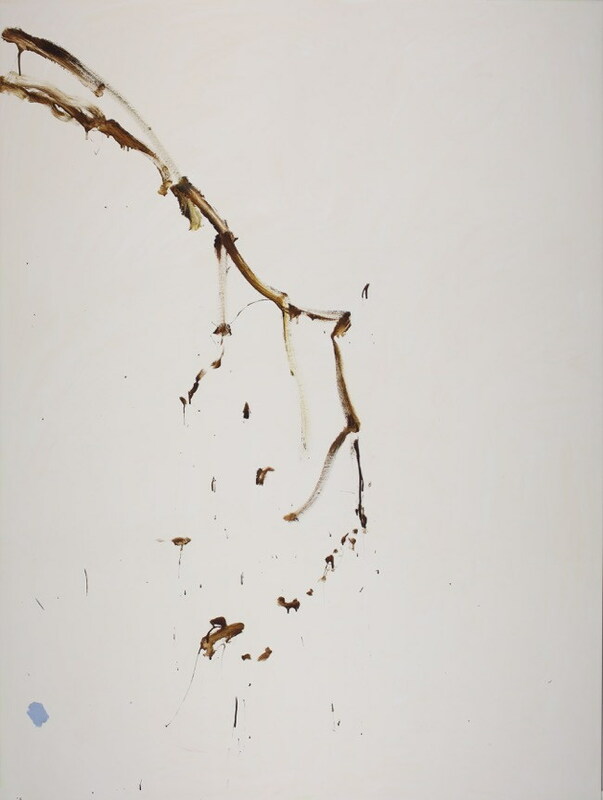 Includes works by John R Walker from his Shed series. Opening Friday 13 April. 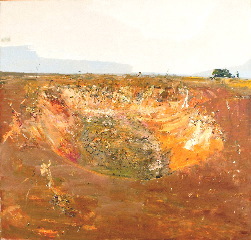 Bouddi 1987, oil on canvas. Parliament House Art Collection. On display. 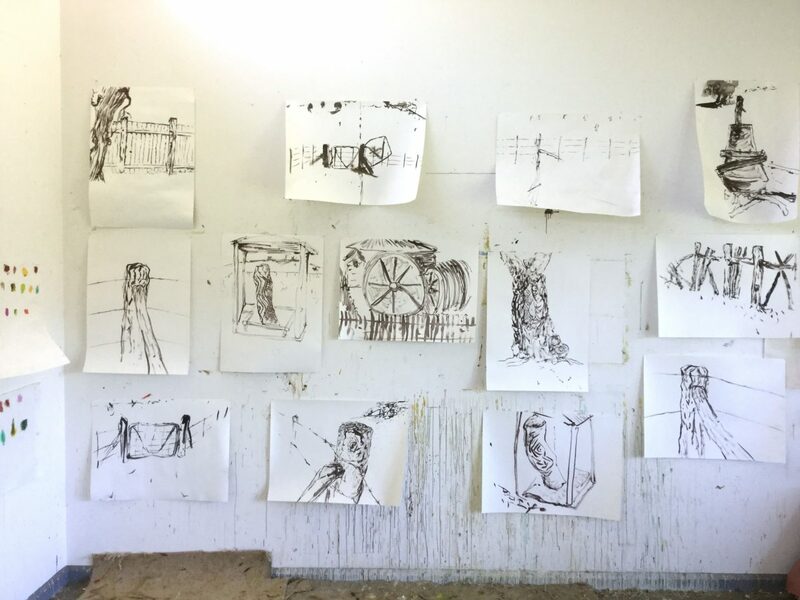 And a recent interview by Varia Karipoff for January’s ART GUIDE, in preparation for the 2018 Adelaide Biennial of Australian Art opening Friday 2 March: read it HERE! 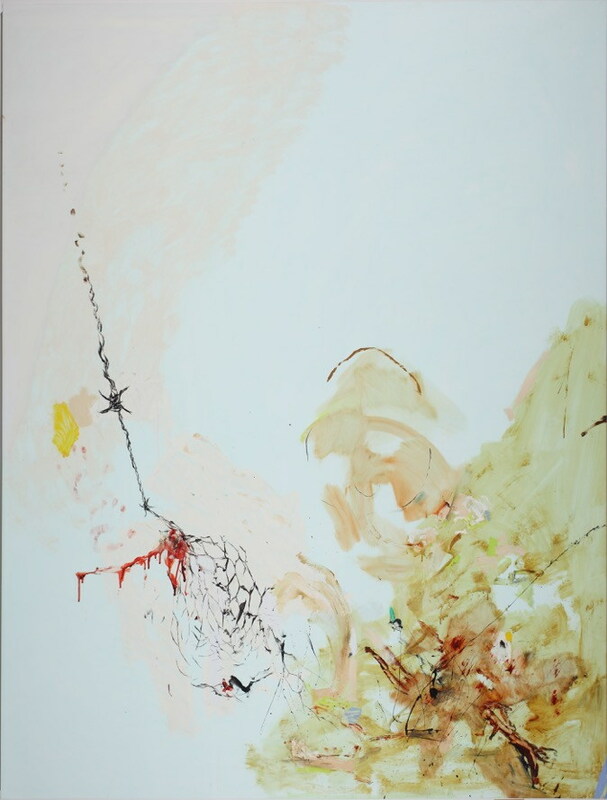 John R Walker is one of the selected participating artists in the 2018 Adelaide Biennial of Australian Art which opens as part of the Adelaide Festival on Friday 2 March 2018. 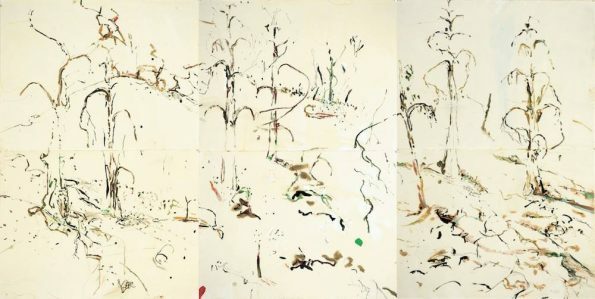 Curated by Erica Green, Director of Samstag Museum of Art, the exhibition will run from 3 March to 3 June at the Art Gallery of South Australia, Samstag Museum of Art and Adelaide’s Royal Botanic Gardens. John’s major suite will be in one of the main galleries of AGSA. Let John know if you are planning to be in Adelaide for the Biennial launch from 2-4 March 2018. 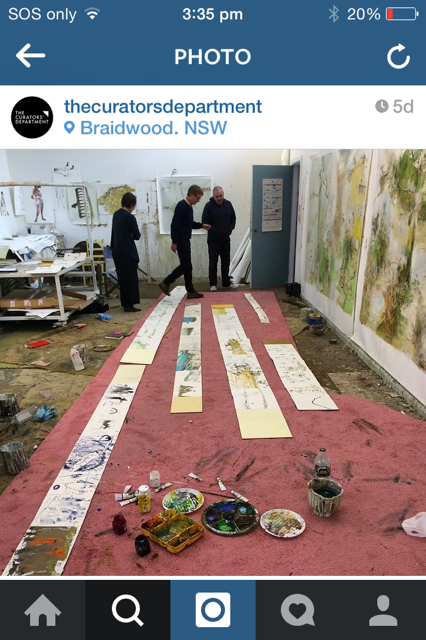 There is also a possible launch of smaller works on paper with a performance scheduled for mid April in Burra, South Australia. Again if you are interested in coming down for this while visiting Adelaide, please do let us know. 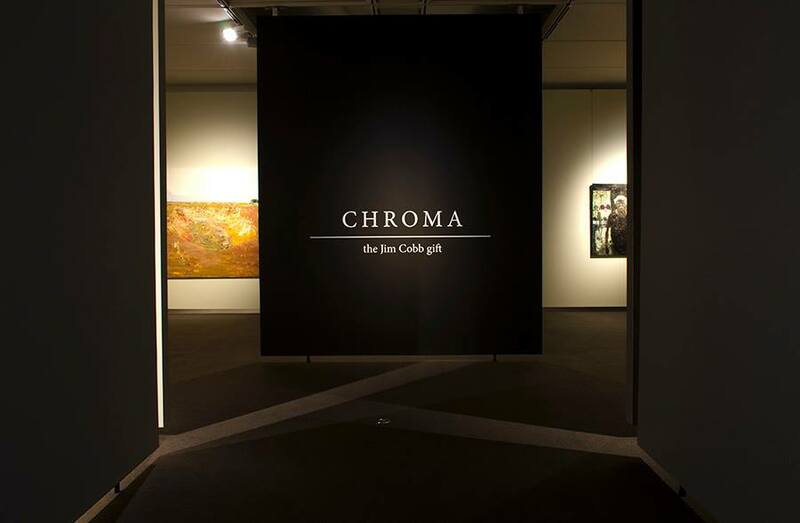 John’s major work for the Biennial draws inspiration from Burra and surrounds as well as the northern Flinders Ranges. Burra is an historic mining town (with a history somewhat similar to Braidwood) and also a favoured location for a number major Australian films (again, similar to Braidwood). 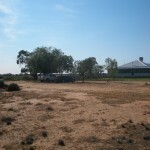 For information about accommodation, wine trails, Adelaide, Flinders Ranges and Burra go to Visit South Australia. Artists’ scheme: a good idea at the time, till it dodged own appraisal. Artist talk: John R Walker @ S H Ervin Gallery, Saturday 28 August, 3pm. 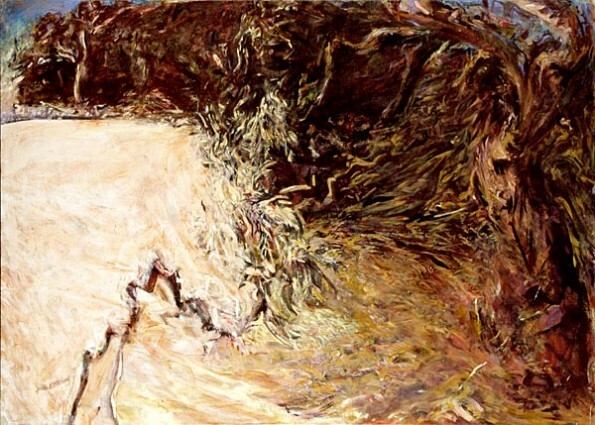 Flood Creek approaching summer 2014, archival oil on polyester canvas. “The Dry Dam, Bedervale” 2004 archival oil on polyester canvas 190.5 x 199 cm. 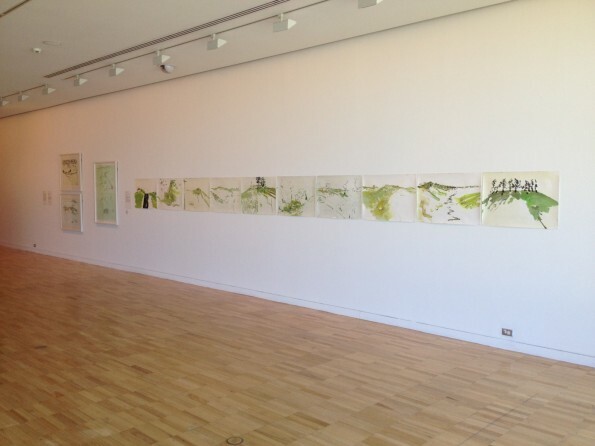 Orange Regional Gallery Collection. 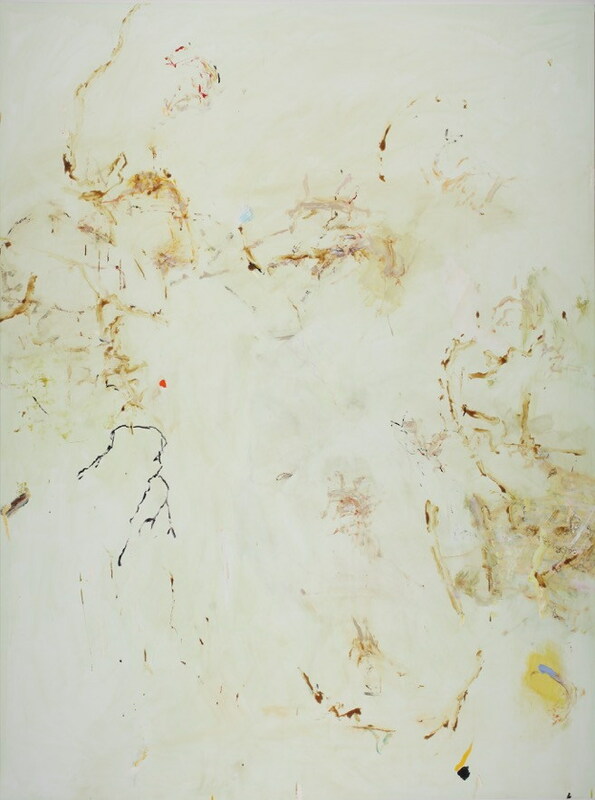 Curated by Glenn Barkley, this major survey show entitled, ‘Here I give thanks’ will showcase John R Walker’s work in Canberra offering a fresh insight into John’s work and including some new and previously unexhibited canvasses. 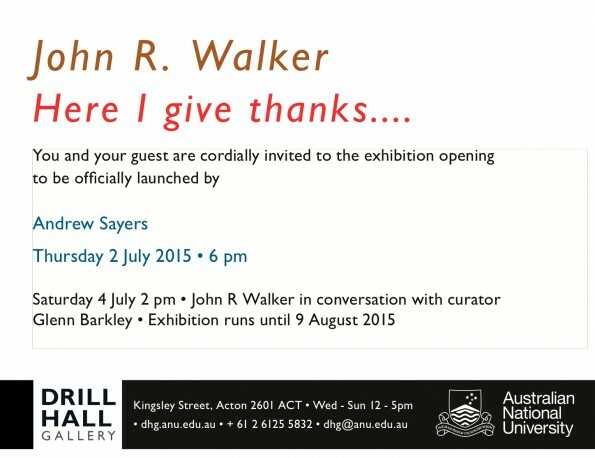 Curated by Glenn Barkley, this major survey show entitled, ‘Here I give thanks’ will showcase John R Walker’s work in Canberra offering a fresh insight into John’s work and including some new and previously un-exhibited canvasses. 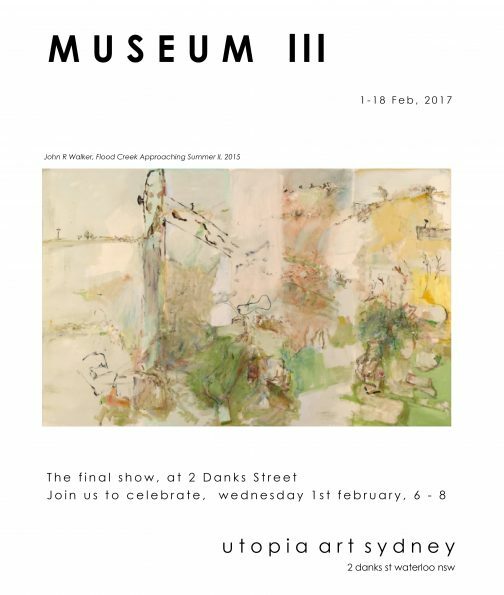 If you would like to know more about this exhibition or would like to receive an invitation, please go to ‘Contact’ heading in the above menu list, click on drop down ‘Enquiries’ and send your information.Or contact Drill Hall Gallery or Utopia Art Sydney (details above). But wait..there’s more…here’s a tempting little taste of what’s to come from The Curators Department. There’s lots to do and see in Canberra in July and early August: ballooning, truffle festival time and other great exhibitions, especially All that fall at the National Portrait Gallery (because Anne Sanders and Chris Chapman curated it!). 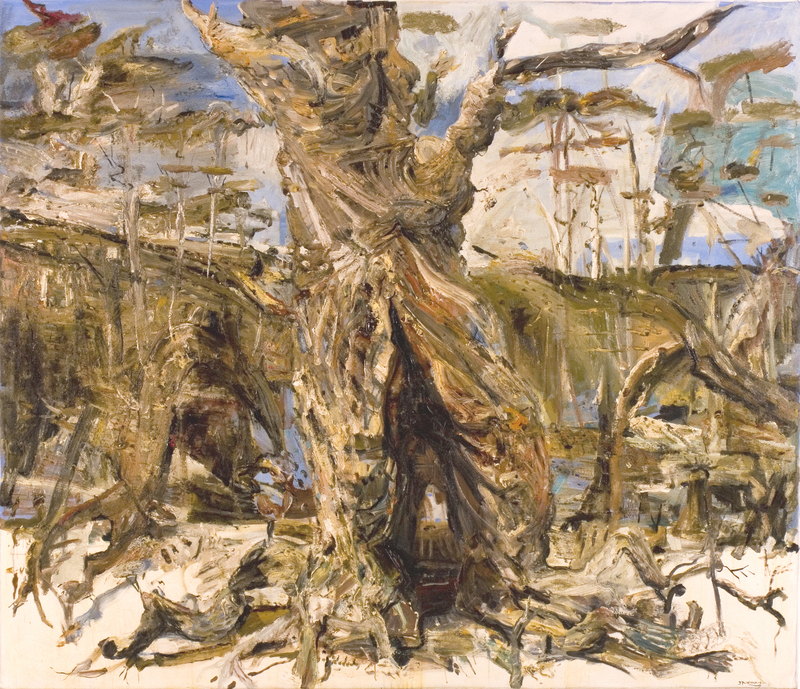 “Six Days in Bundanon and I Give Thanks to Boyd” 2001 archival oil on polyester canvas 180 x 210 cm. Shoalhaven Ridge 2001, oil on canvas, 9 panels. Artbank Collection. 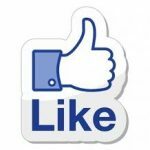 Currently leased to a major departmental client in Canberra. Bouddi 1987, Parliament House Art Collection, purchased 1988. Currently on display. Currently on: includes a number of my major works including, Dry Dam 2004 (left). View the online catalogue. 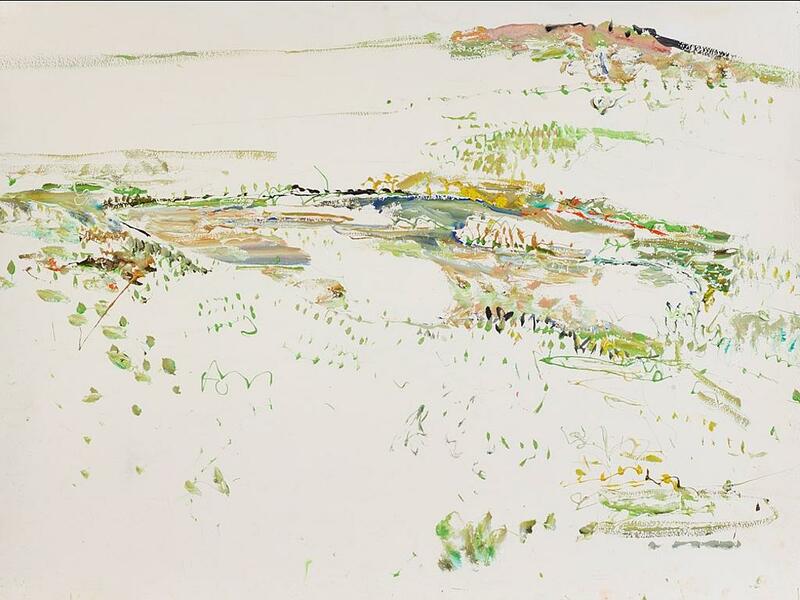 Country and Western: Landscape re-imagined 1988-2013 @ Perc Tucker Regional Gallery, Townsville 24 July – 20 September 2015 and touring. Friday 17 Oct 2014 @ 9.45am AEST: to the person from the Netherlands who just clocked as the 10,000th view and the 3,035th viewer! That’s 10,000 views in just over 12 months; averaging 233 views per month and just over 3 pages per viewer. 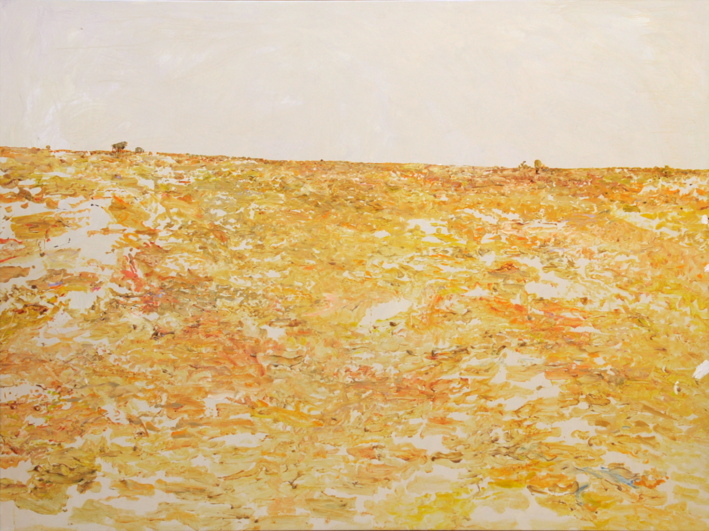 “Parched” 2006 archival oil on polyester canvas 183.5 x 331 cm. “In 1985 one of the first works of art I selected for Canberra’s Parliament House Art Program was by John R Walker. 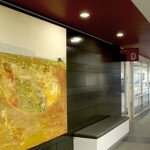 The painting was called Bouddi and hung in the foyer on the first floor. 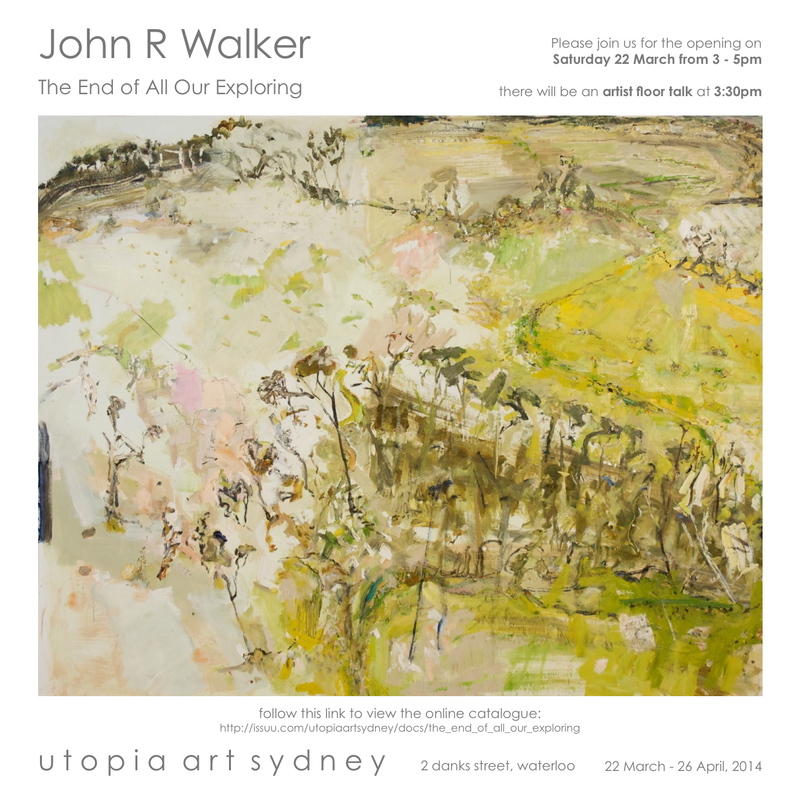 Walker was in his twenties and had a studio on the premises that would become Utopia Art Sydney in 1988. I was greatly impressed by this young artist and his work”. 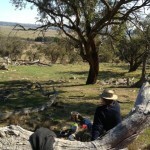 Katrina Rumley, Director, Moree Plains Gallery 2014. 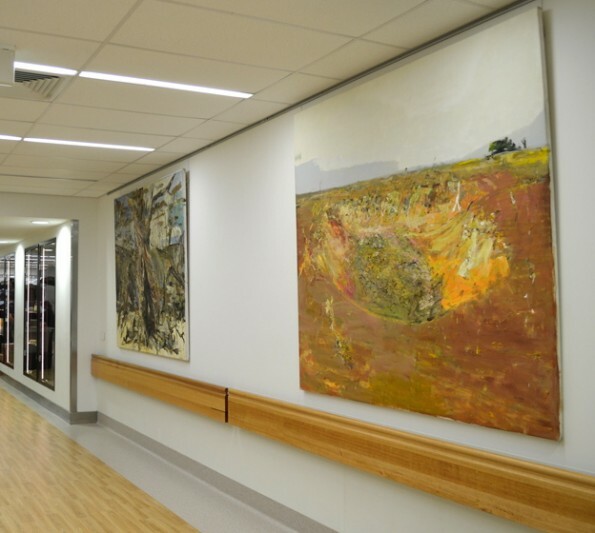 Hollow Tree, Bundanon 2001 and Dry Dam 2004 on display at Orange Base Hospital. 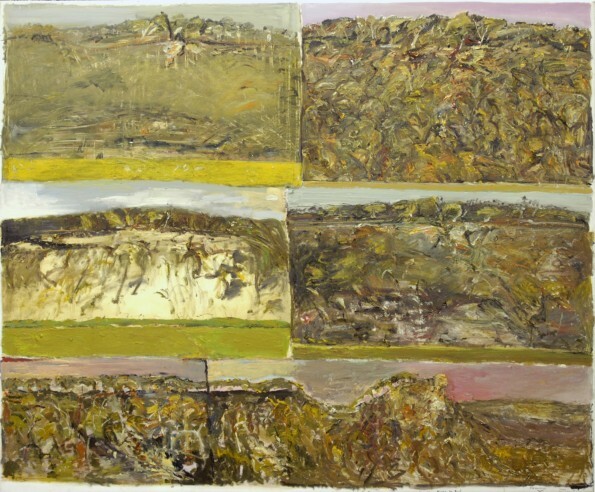 According to the curator, many patients and visitors remember these works from the Terroir: big land pictures exhibition at Orange Regional Gallery in March-April this year. a pleasant and quick 5 min walk through the Domain from each other. 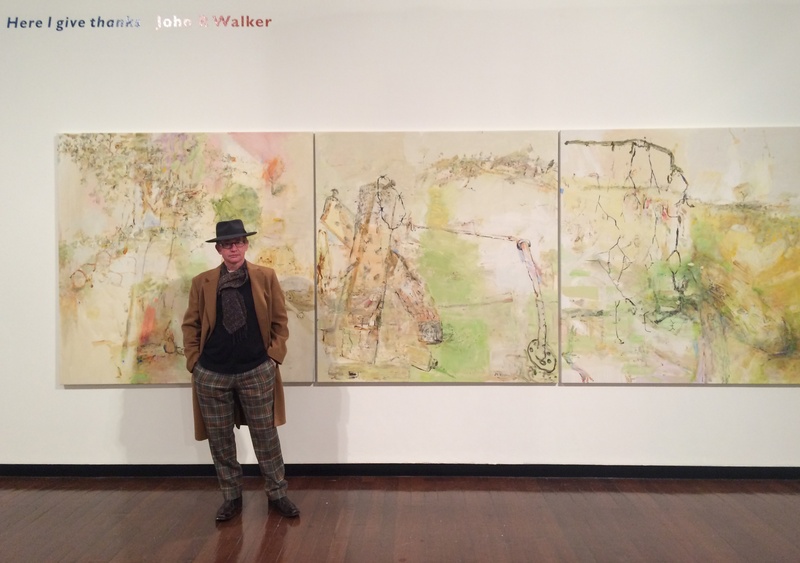 Visit both to see John R Walker’s works and grab a coffee! 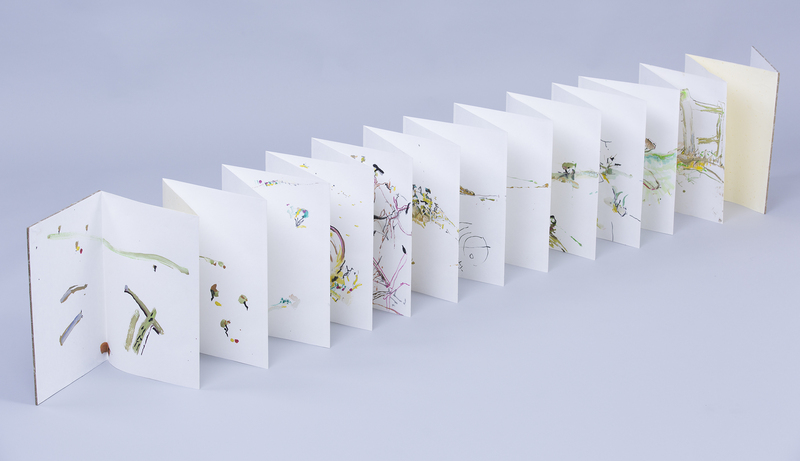 ‘Corrigan’s Bay’ 2002 concertina artist book gouache and ink on chinese paper (partially unfolded). Collection State Library of New South Wales. 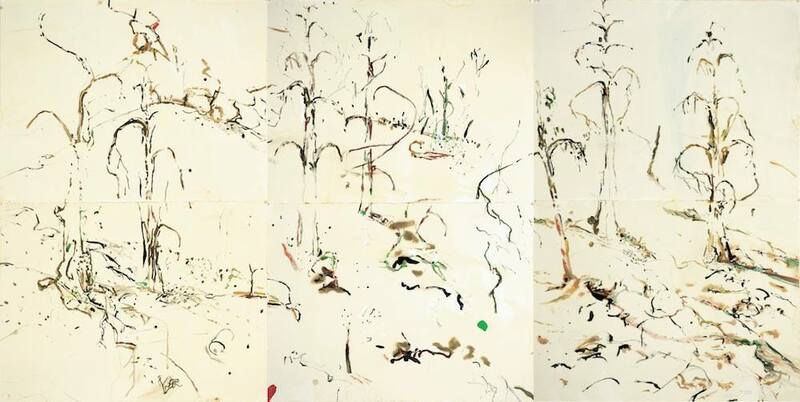 ‘Trees’ 2003 concertina artist book gouache and ink on chinese paper (partially unfolded). Collection State Library of New South Wales. John R Walker’s painting Darling at Kalyanka is one of the finalist works in the forthcoming Wynne Prize for Landscape Painting. Go and have a look; its on until the end of September. The Darling at Kalyanka, archival oil on polyester, 178 x 186 cm. stretched towards the rain-draught from the night. opening on Saturday 15 March to 27 April 2014. 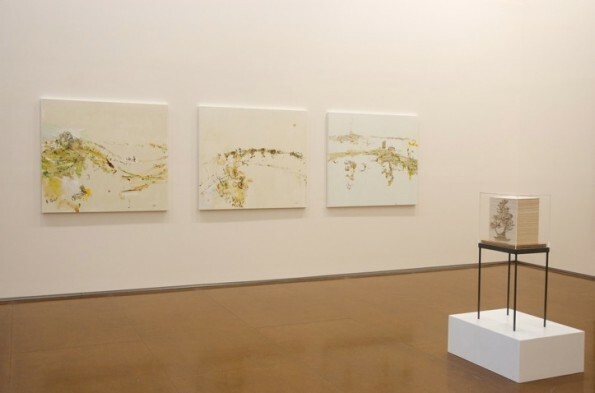 Public exhibition venues where it is possible to exhibit a suite of large paintings, some up to 5 metres long, in the one exhibition space are not common. 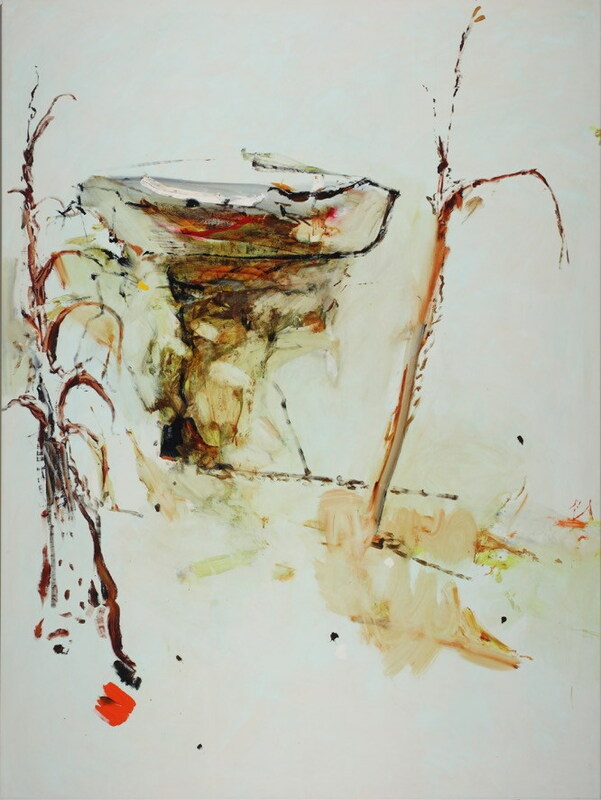 Orange Regional Gallery is unusual in that it has a large gallery space for exhibiting these works together. 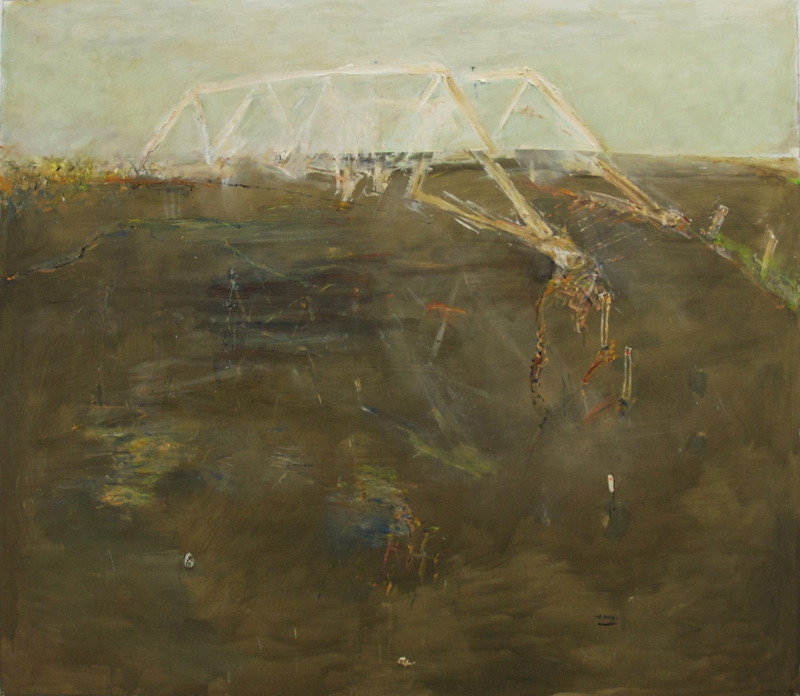 It offers a rare opportunity to experience something special: a suite of very large paintings by John R Walker which have been made over almost a decade as a big narrative of land, place and time. 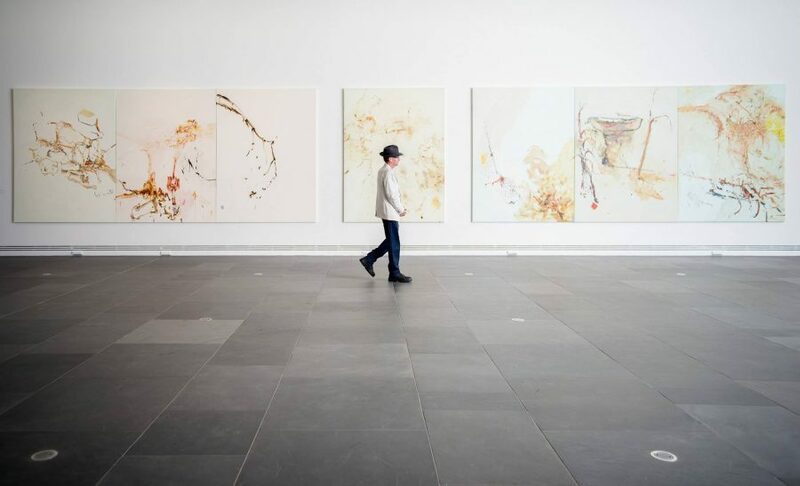 Orange as a city is a perfect weekend trip from Canberra and Sydney, offering as it does, great art, fine wine, excellent food, historic villages and glorious countryside. The exhibition will also coincide with the Orange FOOD week (4 – 13 April 2014). 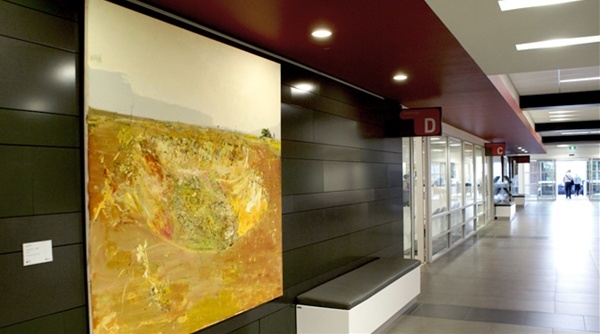 The exhibition at Orange has its origins in the strong visceral responses of patients, visitors and medical staff at the Orange Base Hospital to the large painting, Dry Dam Bedervale 2004, hanging in the hospital foyer. 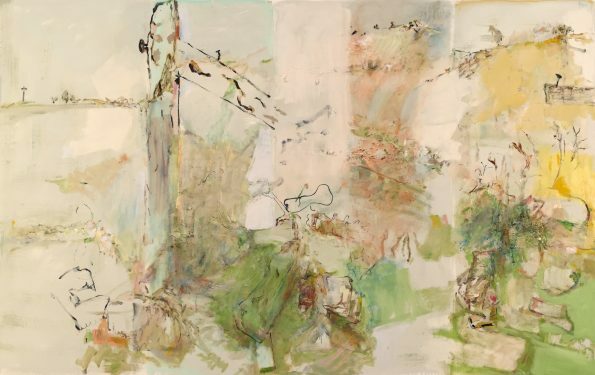 Despite the painting being aggressively modernist and not at all traditional, people who have lived and worked on the land have instinctive, direct responses to the work. 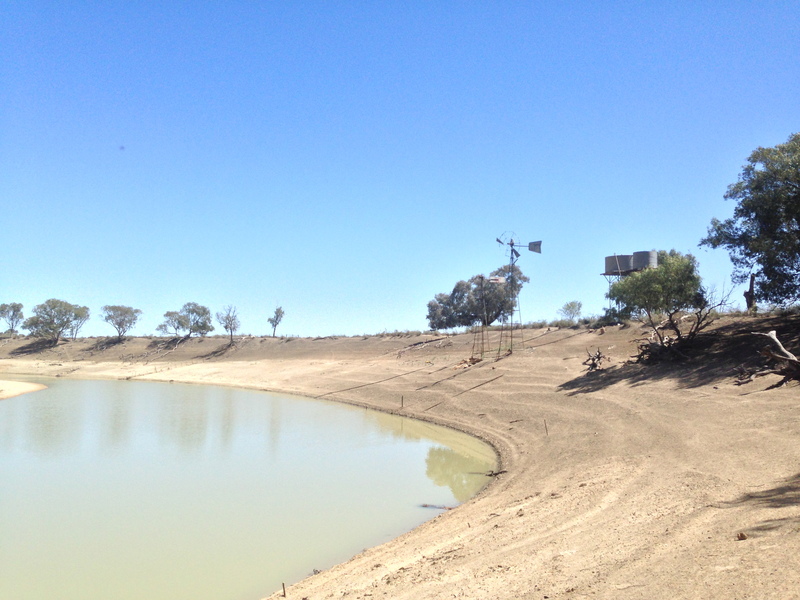 Dry Dam Bedervale was painted at the height of the last big drought. 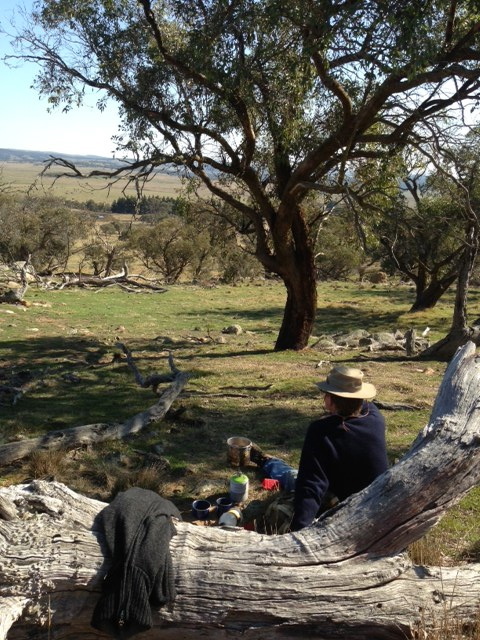 Walker’s neighbour in Braidwood, retired grazier Ian Wright, remarked on his first reading of Patrick White’s Tree of Man that he was startled by how much White knew about what real farming felt like. 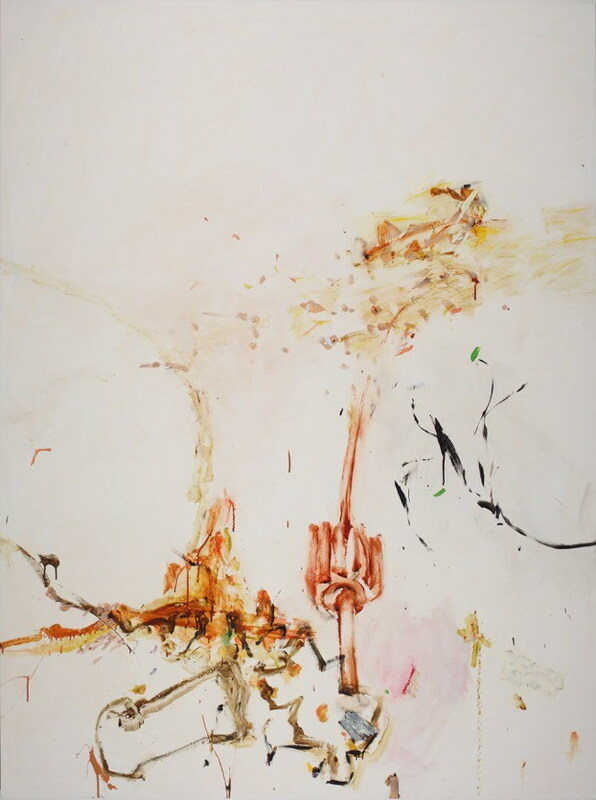 It is this experience of recognition that Walker’s paintings elicit in the viewer. 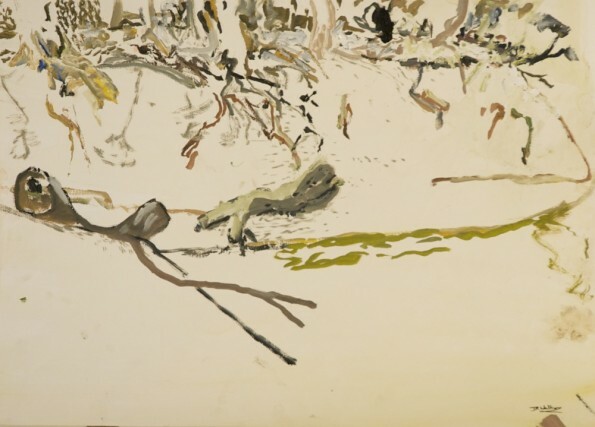 Landscape, Utopia Art Sydney 2 – 23 November. 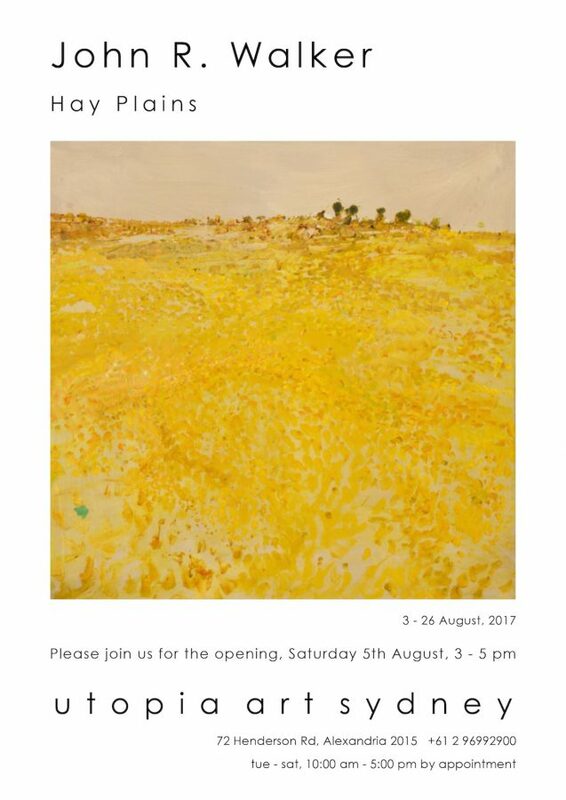 Opening this Saturday. 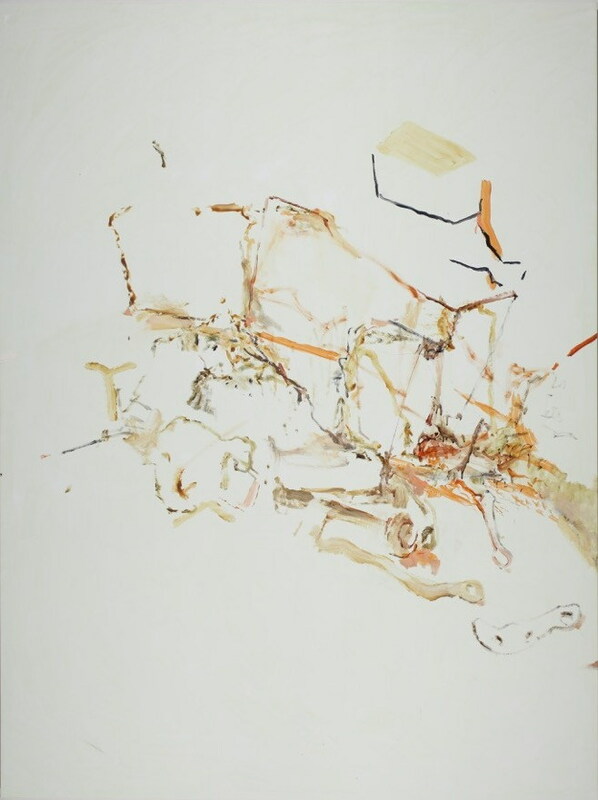 Scroll down to bottom of page for more details on the forthcoming survey at Orange Regional Gallery, March – April 2014. 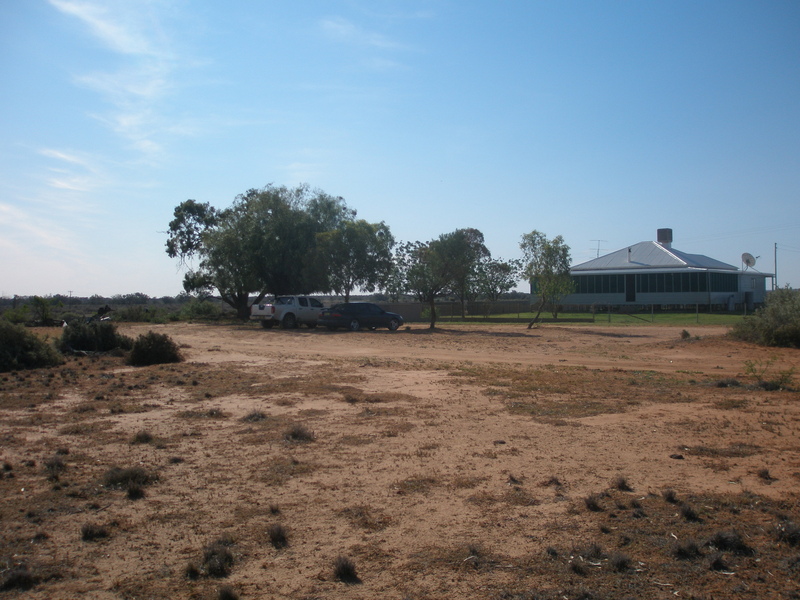 Have just returned from an 11 day road trip – more than 2,800 kms – to Wilcannia, via Orange, Cobar and the Mt Grenfell’s Aboriginal ochre drawings – staying with artist-friend, now Kalyanka Station manager, Jonathan Throsby. 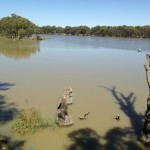 We returned via Mutawintji, Broken Hill, Menindee Lakes, Mildura and Naranderra. 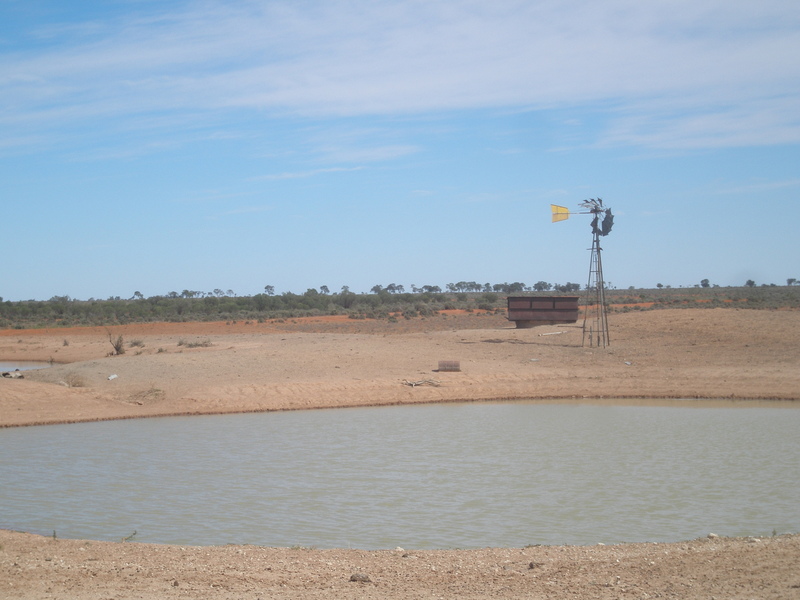 Spent 5 days at Kalyanka Station, which runs about 14,000 Dorper sheep on 125,000 hectares and runs along the magnificent Darling River. 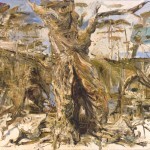 I particularly remember the Leopard wood trees west of Wilcannia. These are trees that when young look like a barbed-wire tangle, however, when the trunk has developed to more than 12 feet, the ‘barbed-wire’ defences against browsers are dispensed with. These trees are reminders of the megafauna that used to browse these ancient plains. The trees protected themselves against giant kangaroos that could reach to about 10 feet. Once the trees got higher than the browsers could reach, there was no longer any need for the defences. 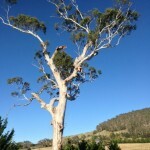 Despite the fact that these giant browsers have been extinct for about 40,000 years, the Leopard trees still remember…. you can never be too sure!! 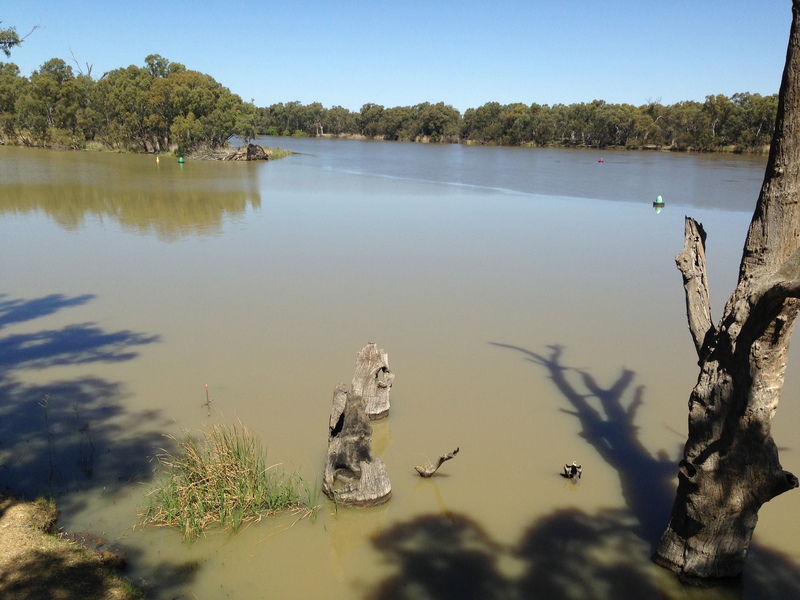 Confluence of the Darling and Murray River systems at Wentworth, 550kms downstream from the Darling at Kalyanka. In this mortal frame of mine which is made of a hundred bones and nine orifices there is something, and this something is called a wind-swept spirit for lack of a better name, for it is much like a thin drapery that is torn and swept away at the slightest stir of the wind. This something in me took to writing poetry years ago, merely to amuse itself at first, but finally making it its lifelong business. It must be admitted, however, that there were times when it sank into such dejection that it was almost ready to drop its pursuit, or again times when it was so puffed up with pride that it exulted in vain victories over the others. Indeed, ever since it began to write poetry, it has never found peace with itself, always wavering between doubts of one kind and another. At one time it wanted to gain security by entering the service of a court, and at another it wished to measure the depth of its ignorance by trying to be a scholar, but it was prevented from either because of its unquenchable love of poetry. The fact is, it knows no other art than the art of writing poetry, and therefore, it hangs on to it more or less blindly. 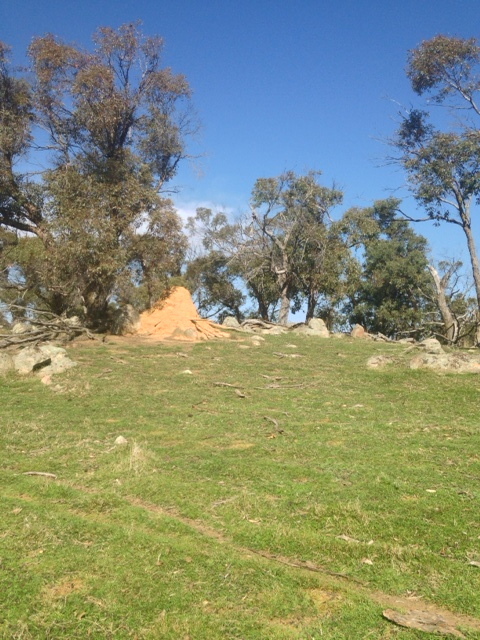 I’ve been walking around an area called Dough Boy about 25 kms from Braidwood – granite and sheep country – inspiration for my next body of work. 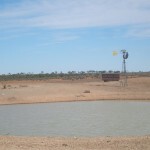 The weather last week was gloriously unseasonal; warm to hot, gentle winds, crystal clear days. Here I am with my little gaz cooker and billy, brewing a cuppa. 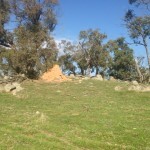 Today, September 12, cycled to the Braidwood Stockyards, left the bike and climbed 2/3 of the way up Mt Gillamatong, the major landmark that frames the town of Braidwood. Another glorious morning, although a bit of an inversion layer meant that there was a slight haze in the air, and the wind was cool! 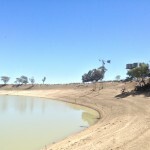 Part way up the dirt road towards the paddock there is one of those wonderful ‘Budgie apartment blocks’ – my photo doesn’t give enough details but there are several breeding pairs of different kinds of birds nested in its generous boles and branches. 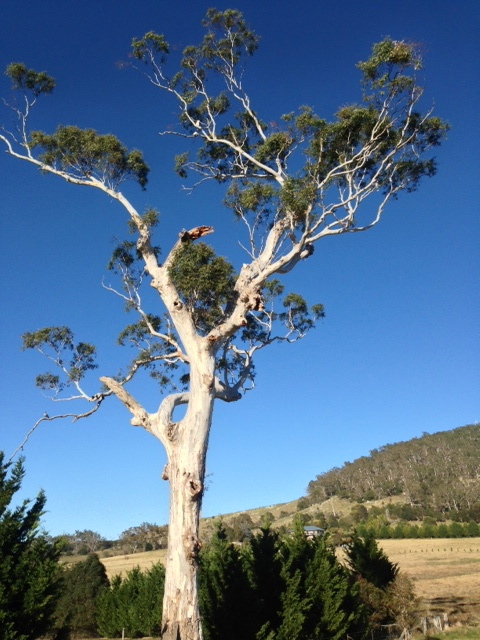 Reminded me of the tree I painted while at Boyd’s Bundanon in 2001.